Info: 3 Bedroom, 3 Bathroom Beachfront Home with over 1600 s.f. 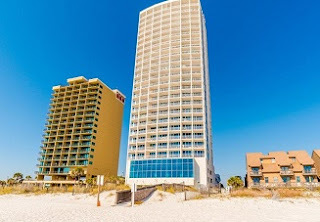 Gulf Shores beachfront condo for sale at Island Tower. This incredible three bedroom, three bath center residence has a private 50' balcony and 2 beachfront master bedrooms! Fantastic location and just a few blocks from the center of town and the Hangout. Great rental history and incredible panoramic gulf views. Stainless steel appliances, granite countertops, and 20" tile throughout. Sold furnished. New HVAC in 2016, and new hot water heater in 2015. The amenities include indoor and outdoor pools, exercise facility, sauna and a BBQ area.